For many years it has been my pleasure to think about the so-called image of Finland. 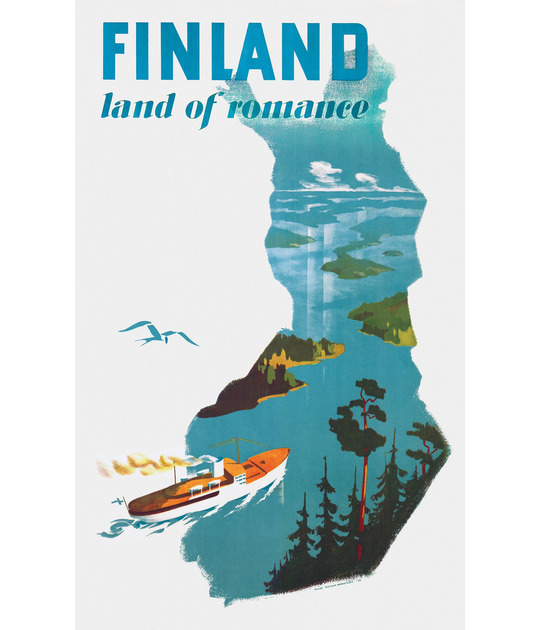 The reason for this is that I have been hooked on Finnish travel posters, i.e., on posters that in the past promoted Finland trying to lure tourists and travelers to this unknown northern country. We speak about big coloured paper prints, above all from the 1920s and 1930s. These posters were created by graphic designers and artists, some of them celebrated internationally known artists, some unknown creators of applied graphics. But all the posters carry an expression that captures me; they are merry, smart and artistic. And the message is wonderfully appealing. I have searched for the posters all over the world, I have bought them from collectors and at auctions. I have admired details and done research on the life histories of the artists. Yes, after more than ten years of wading in this swamp it is absolutely clear: I am a nerd. I have compiled the entire collection of these posters in an exhibition and, of course, I have a wily plan: I want to see additional nerds. Yes, even after the Finnish centenary jubilee (in 2017) I wish to show the vintage look of Finland to the whole world. I have compressed the sustaining message of the posters in three words: Finland is open, glamorous and cosmopolitan. Because the three words that we too often associate with Finland today are secluded, gloomy and quiet. Vividly, alight and openly Helsinki greets its guests. Obviously I cannot know whether this was entirely true. But it sounds good. 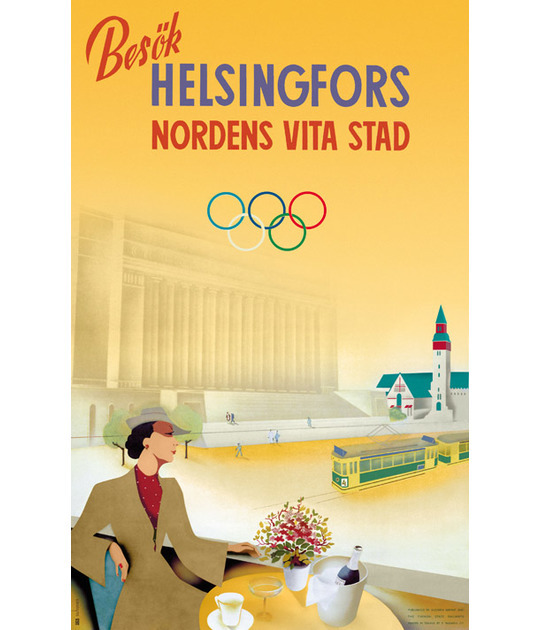 On the poster that for me is the most iconic one (published at the end of the thirties) a lady is sitting at an open-air café in the capital, she has a bottle of champagne on her table, a quiet green tram is jingling past in the background. My interpretation is that there is a free seat at the table. And that this trendy lady is a new rendering of the maiden of Finland. And what does she say? She says: welcome to Finland! Banner photo: ”Elderly woman drinking coffee”, 1910-1930, Svenska litteratursällskapet i Finland (CC license).